Compelling variety breathes life back into the 24/7 restaurant at Caesars Palace. It seems like it was only a few weeks ago that I was telling you how I rarely review 24/7 restaurants located in hotels. Oh wait—it was only a few weeks ago. And then I went on to review Siegel’s 1941 in El Cortez. And now I’m back to write a bit about another around-the-clock casino “coffee shop” worth trying: Café Americano in Caesars Palace. The latest modest entry into Caesars’ star-studded restaurant lineup replaces celebrity chef Michel Richard’s Central. Unlike many writers (and many members of the public), I actually thought Central was a very good restaurant, especially during chef Todd Harrington’s tenure. But asking a chef who has earned Michelin stars to adapt to the 24-hour hotel cycle was certainly a difficult undertaking. Fortunately, Café Americano isn’t saddled with such lofty expectations. Given its prime indoor/outdoor real estate just off the main lobby of Caesars, it could really get away with putting out the same mishmash of predictable staples you’ll find in just about every casino coffee shop. And don’t get me wrong, you’ll find a lot of those on this diverse and occasionally predictable menu. But you’ll also find a few surprises, which is why it’s worth a visit. The first thing that caught my eye was the pizza selection. 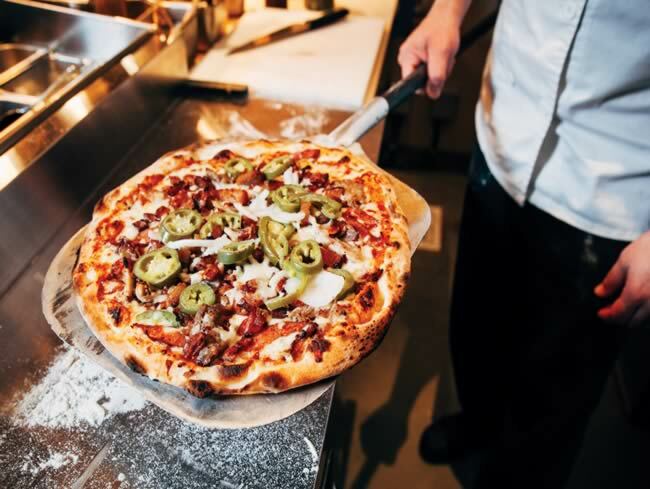 While everyone was oohing and aahing over Caesars’ rather unimpressive importation of Brooklyn’s famed Di Fara Pizza, the folks at Café Americano created an interesting pizza menu. How many other places in town offer a pie with San Marzano tomatoes, hand-cut pepperoni, andouille sausage, braised short ribs, vinegar peppers, whiskey onions, mozzarella and a fried egg? Or another with octopus cured in olive oil, pesto, mozzarella, arugula, Grana Pedano and roasted cipollini onions? And if you can think of someplace that does, I’m guessing you can’t get them at 5 a.m., when you come down with a case of the late-night munchies. And those are just two of the seven pizzas this café offers. Among the pizza selections, I found the octopus to be a bit too close to a salad for my taste, but that’s just because I’m an unhealthy eater who tends to get scared by too many greens on the dish. If you’re a fan of arugula and octopus, you should love it. The Whole Hog—made with pork belly, andouille, pulled pork, pecan-smoked bacon, house-pickled jalapeños, mozzarella, cheddar and a lightly sweet guava barbecue sauce—was a bit more to my liking. And the pizza oven (gas, despite the decorative wooden veneer) also puts out a wonderful dessert in the form of a Nutella and banana calzone. It’s big, messy and delicious. The rest of the menu is surprisingly diverse. Appetizers include such predictable options as fried calamari and sliders alongside more interesting dishes, including short-rib tacos and red-pepper hummus. There are, of course, plenty of burgers and sandwiches. The bar boasts 11 beers on tap and another nine in bottles. A dedicated “skinny menu” features entrées that are less than 500 calories. In the soup section of the menu, alongside French onion and lobster bisque, you’ll find tonkotsu ramen. I’ll admit it might not be as good as what you get at your favorite Chinatown haunt, but it’s still quite satisfying. And a Cubano sandwich I had on a recent trip was solid, but a bit on the salty side. Of all the dishes I’ve had here so far, the only real disappointment was a giant mozzarella-stuffed meatball that was rather dry. Nonetheless, I appreciated the playfulness of creating an inside-out meatball parm, as well as the fact it was accompanied by delicious house-made ricotta and vinegar peppers. Every time I wander into Café Americano, I see staff I recognize. Some are holdovers from Central, while others I know from various other establishments. But the service has been nothing but fantastic. Although Café Americano is far from fine dining or haute cuisine, Caesars Palace isn’t exactly lacking in those spots. Here, I found a place that’s interesting enough to make me rethink my disdain for round-the-clock casino joints, and satisfy my appetite any time of day. Caesars Palace, 702-731-7110, Caesars.com. Open daily 24 hours. Dinner for two, $40-$100.